For a six week period, the prestigious Royal Society of Painters in Watercolour has an exhibition at the Stirling Smith Art Gallery and Museum. The RSW, established in 1876, is exhibiting in Stirling for the first time with a selection of fifty new works of art by some of the best contemporary Scottish artists. James McDonald, born in Stirling in 1956, is an accomplished artist and RSW member. He is well known for his Trompe-l’œil paintings, where details are rendered giving a three-dimensional effect. In recent years, some of these have had a Scottish food theme, like ‘piece ‘n’ jam’ and ‘chips on a roll’. His life and portrait painting is also exquisite in its detail and has the kind of finish and presentation present in an Old Master. 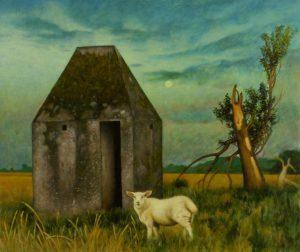 In homage to Stirling, he has selected the strange abandoned landscape of Bandeath, depicting a disused military blast shelter, juxtaposed with a peaceful lamb. The Bandeath development began as an Admiralty Depot during World War I, with a nearby PoW camp, after which it remained in use and became a Royal Naval Armament Depot during World War II. When it was redeveloped as an industrial estate in the 1980s, many of the military buildings were reused, and these remain to this day. The RSW exhibition runs until 20 November.